There are several one-way routes possible in the Aegean Sea since Lavrion and Athens; Alimos marina are upwind from the Cycladic main yacht charter bases of Syros, Paros and Kos. Furthermore, the ports of Mykonos, Milos and Santorini increasingly serve as useful secondary bases for yacht charters as well. Frequent domestic flights, ferries and hydrofoils connect these islands with Athens Airport and Piraeus Port. Day 5 Thu Kythnos Mericha or anchorage in sandbar bay. Day 5 Thu Kythnos, Mericha port or anchorage in sandbar bay. Alternatives for Athens to Paros in 14 days: click on the chart below for full-size ! Several islands - notably Sifnos, Amorgos, Andros, Santorini, Symi, Tinos, Paros - are worth more than one day !!! Note, that in the above one-way itineraries - in contrast to the Saronic, Cyclades, Ionian and Dodecanese routes - I have opportunistically incorporated sailing the first day (Day 0). Planning to sail the Aegean, should mean you are an experienced yachtsman and reaching for Kea should even in twilight pose no added risk if you are qualified enough to make such a landfall. When sailing with reputable yacht charter agencies the handover of your yacht can be arranged much earlier in the afternoon. Between Kalymnos/Leros and Amorgos you will find the lovely islets of Kinaros and Livitha, the latter offering the best anchorage, totally secluded, usually mooring buoys. East of Astypalea - totally off the beaten track - is the islet of Ioannis which has a nice solid anchorage at the south (loads of Ifalos here) and from there dead east to Nisyros. Denoussa (islet east of Naxos) to Patmos. Between Andros or Tinos and the Southern Sporades - notably Ikaria island (this is part of the east and then south route). This is also the recommended route when returning upwind in heavy weather such as the Meltemi. The large fetch of more or less unblocked sea all the way from Mount Athos, allows for higher waves in the open waters between the Dodecanese and Cyclades! 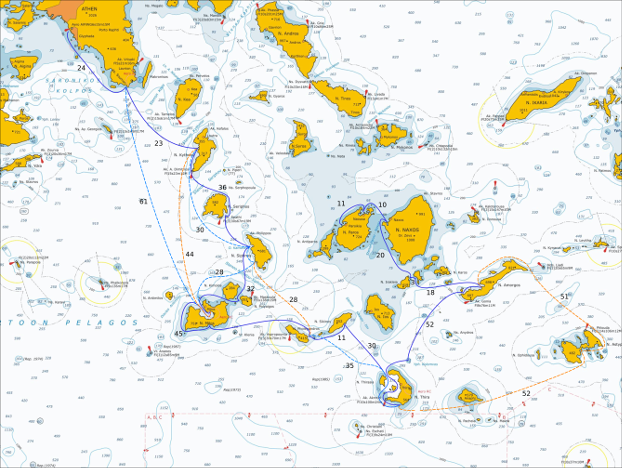 Greek chart terms and toponyms for sailing in Greece. The Wind roses of Greece. Feel free to contact me if you have any questions or if you want to know more about cruising in Greece and trustworthy yacht charter firms for these one-ways.